A truck passes Bath Iron Works in Bath on a spring night. BATH, Maine — One day after Gov. Paul LePage signed into law a $45 million tax break for Bath Iron Works, leaders of the shipyard’s largest union blasted the management for laying off 31 employees while hiring for new positions. 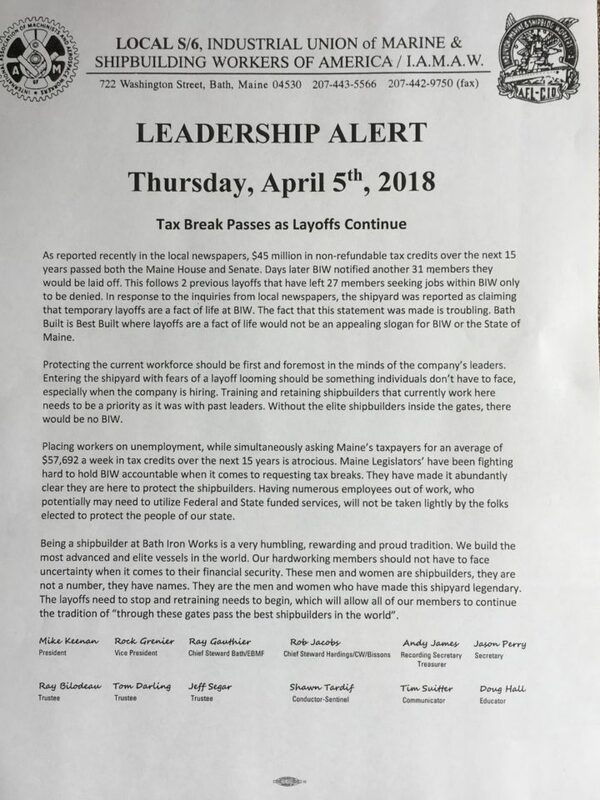 In a leaflet distributed Thursday at the shipyard, leaders of Local S6 of the Machinists Union wrote that the 31 layoffs announced Friday are in addition to 27 employees still out of work due to previous layoffs, whom Local S6 president Mike Keenan said Thursday have been denied new positions. 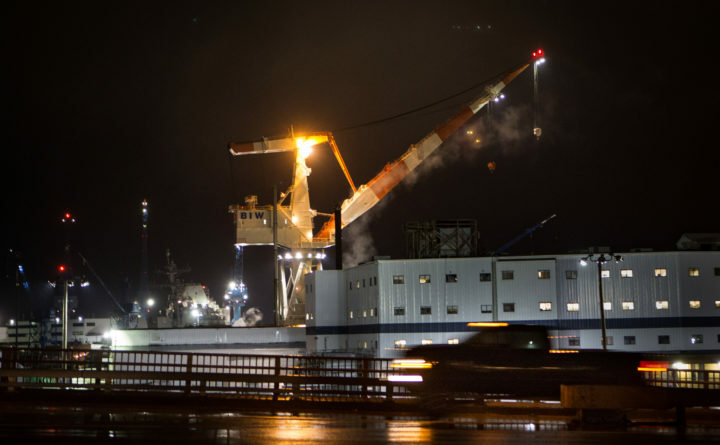 On Friday, shipyard spokesman David Hench said the company expected that between attrition and new hires, BIW expects to hire and train approximately 500 people over the course of the year. Hench did not immediately return a request for comment on Thursday. The bill, signed Wednesday by Gov. Paul LePage, was scrutinized for months as legislators debated whether the state receives enough return for the tax credits, which in this case comes in the form of lost tax revenue on one hand and more than 5,000 high-paying jobs with benefits on the other. BIW has received a total of $60 million in state tax breaks during the past 20 years, which started in the 1990s when the shipyard was in danger of failure. That package of tax credits expired, prompting Rep. Jennifer DeChant, D-Bath, to introduce a new bill this year. The Legislature’s Taxation Committee amended her original version to include new conditions and benchmarks. Among other conditions, the final version of the bill requires BIW to maintain at least 5,500 jobs — up from 5,000 in the initial bill — to receive the full tax break. Keenan said Thursday that he was contacted by BIW managers who were extremely unhappy the leaflet was distributed.